There's nothing like a pep rally at Nike Chicago to get fired up for Sunday's Bank of America Chicago Marathon. I say this because I've been going to these pep rallies since 2005 and they only get better. Take this year, which also happened to be the first Nike Run Club run since Nike Chicago closed in March for its overhaul and only reopened last week. Sure, the third floor, now the run floor, was full of runners and marathon gear, but how about a dee-jay and star-studded cast to send runners on their routes? 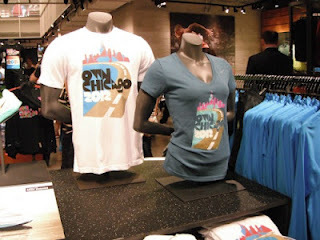 Who's ready to #ownchicago on Sunday? 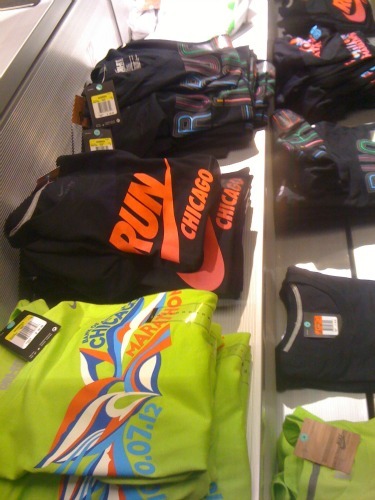 We love our gear, especially when it shouts Chicago during marathon time. 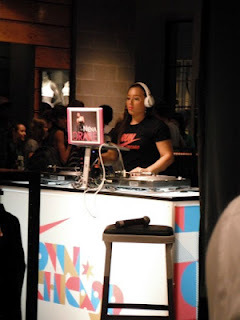 There's that dee-jay, turning the third floor in Club Run Nike. Do you recognize this foursome? Giuliana and Bill Rancic got things started and then brought out Dathan Ritzenhein and Wesley Korir. 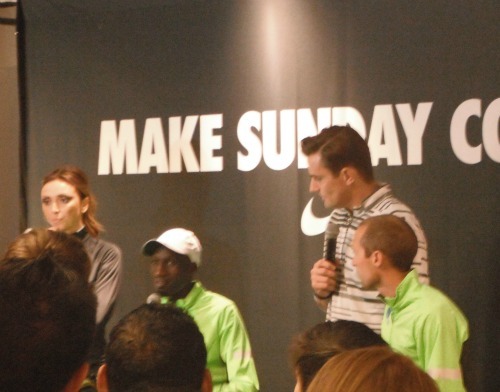 Giuliana and Bill Rancic said they want to run the marathon next year, pushing baby Edward in the jogger stroller. Or maybe it was pushing him around to spectate since jogger strollers are a no-no? I feel terrible for not remembering a word of what Wesley said, but here's what Dathan had to say about Chicago, "It's flat, it's fast and the crowds are awesome!" He'll toe the line for the first time at Chicago, only weeks after running the 10,000 meters at the London Olympics. Lucky me! 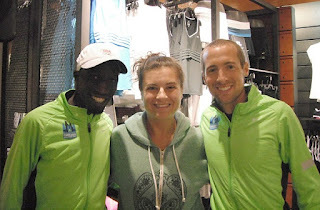 Maybe the energy from two speedy runners, Wesley Korir and Dathan Ritzenhein, will rub off on me? I can only hope.